Although I was mainly at Vandem for the gnarly skating shots and to support Ash and our skating friends, the fashion loving side of myself also kept my eye on the clothing which was coming down the hill. There were a lot of bright, fun shorts, vest tops, and colour matching; from the normal skater to the quirky and distinctive. There were a lot of full leathers, obviously you want to keep yourself as safe as possible when travelling 40+mph on board, and quite often these were not only colour co-ordinated with their helmets but also their boards! There were a lot of brightly coloured shorts. 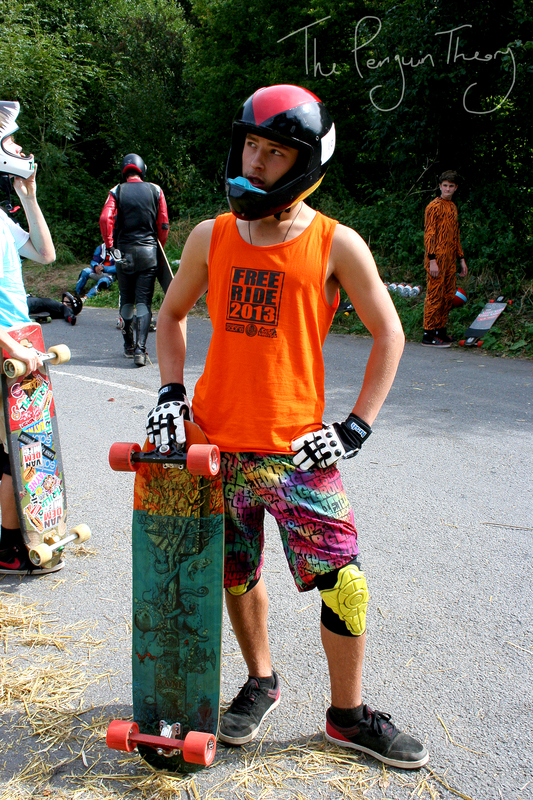 Colour co-ordinated with his board – which, by the way, is the board I really want. Ash even sported a few Penguin Theory tops along with his own bright shorts! And of course no event is complete without a bit of fancy dress! There to keep order, protect the innocent and shred hard. The jacket to rule all jackets? 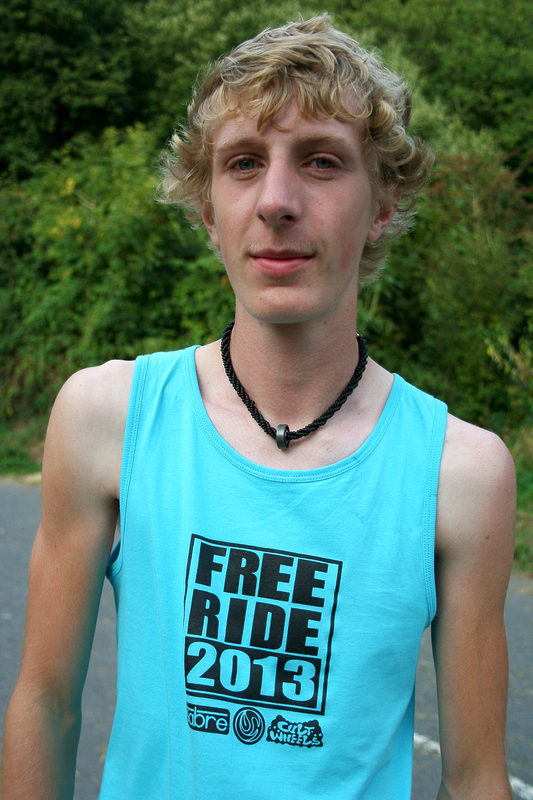 But my favourite fashion find from the weekend was around the neck of a skater named Ryan Swanton. 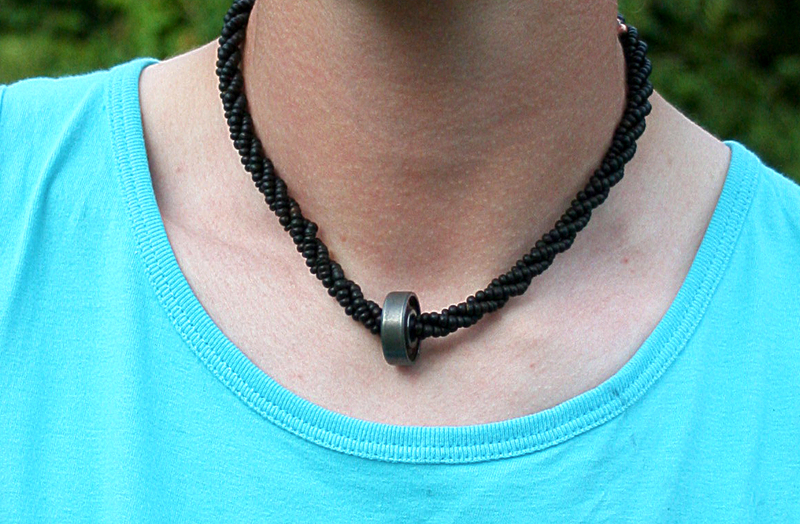 Not only did he look pretty cool in his sporty shorts and vest top, but he was wearing a nice black beaded necklace to which he had attached an old rusty bearing. Ryan has been skating for around 2-3 years but this was his first time at Vandem. I asked how he found his Vandem experience and he told me that ‘it took a while to ease in, but all today i’ve been getting faster’. He agreed with me that it was extremely well run and he would definitely be coming again next year! I actually have some old ruined bearings in my drawer and so think I might make some jewellery out of them for myself. Thanks for the inspiration Ryan!